To gain an understanding of relative reaction rates. To gain an understanding of instantaneous reaction rates and initial reaction rates. Notice that a negative sign is included when expressing reaction rates with respect to the disappearance of starting materials. Reaction rates are always positive, so the decrease in concentration must be corrected for. The decomposition of dinitrogen pentoxide 2 N2O5(g) → 4 NO2(g) + O2(g) was performed in the lab and the rate of formation of NO2 was found to be 0.53 M/s.1. What was the rate of formation of O2(g)? 2. What was the rate of consumption N2O5(g)? For most chemical reactions, the rate of the reaction tends to decrease as time passes (Figure 17.6 “Reactant Concentration vs. Time“). As the reaction proceeds, more and more of the reactant molecules are consumed to become product, which lowers the concentration of reactant molecules. The reduction in reactant concentration results in fewer effective collisions. The decrease in reaction rate over time means that average reaction rates do not accurately represent the actual rate of reaction at all time points. Instantaneous reaction rates, the rate of reaction at one instant in time, can be determined from the slope of the tangent at that point in the plot of concentration vs. time. 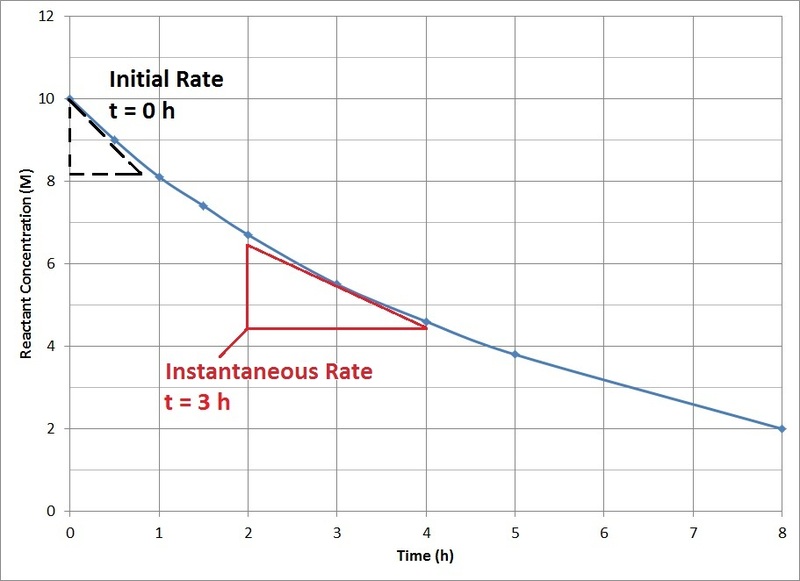 The instantaneous rate at the start of the reaction, t = 0, is of particular interest in kinetics and is known as the initial rate of the reaction. A plot of reactant concentration vs. time for a hypothetical reaction. Use Figure 17.6 to determine the instantaneous rate at 3 h.
The slope of the tangent at 3 h can be determined by drawing a triangle such as the one shown in Figure 17.6, and comparing the ratio of the height of the rise to the run of the length. Reaction rates can be measured by the disappearance of starting material or the appearance of the product over time. Instantaneous reaction rates can be determined from the slope of the tangent at that point in the plot of concentration vs. time. The initial reaction rate is the instantaneous rate at the start of the reaction (at t = 0). Reaction Rates by Jessie A. Key is licensed under a Creative Commons Attribution 4.0 International License, except where otherwise noted.